The 2015 Toyota/Save Mart 350 was a NASCAR Sprint Cup Series race held on June 28, 2015 at Sonoma Raceway in Sonoma, California. Contested over 110 laps on the 1.99 mile (3.2 km) road course, it was the 16th race of the 2015 NASCAR Sprint Cup Series season. Kyle Busch won the race, first of the season and first since the 2014 Auto Club 400. Brother Kurt Busch finished runner-up and Clint Bowyer finished third. Kevin Harvick and Joey Logano rounded out the top five. A. J. Allmendinger won the pole for the race and led one lap before engine issues took him out of contention and finished 37th. Jimmie Johnson led a race high of 45 laps before getting passed for the lead with a few laps to go and finished sixth. The race had nine lead changes among five different drivers, as well as five caution flag periods for 21 laps. There was one red flag period for ten minutes and 30 seconds. This was the 30th career victory for Kyle Busch, second at Sonoma Raceway and fourth at the track for Joe Gibbs Racing. This win moved Busch up to 37th in the points standings. Despite being the winning manufacturer, Toyota left Sonoma trailing Chevrolet by 94 points in the manufacturer standings. The Toyota/Save Mart 350 was carried by Fox Sports on the cable/satellite Fox Sports 1 network for the American television audience. The radio broadcast for the race was carried by the Performance Racing Network and Sirius XM NASCAR Radio. Sonoma Raceway, the track where the race was held. Sonoma Raceway, formerly Sears Point Raceway and Infineon Raceway, is a 2.52-mile (4.06 km) road course and drag strip located on the landform known as Sears Point in the southern Sonoma Mountains in Sonoma, California, USA. The road course features 12 turns on a hilly course with 160 feet (49 m) of total elevation change. It is host to one of only two NASCAR Sprint Cup Series races each year that are run on road courses (the other being Watkins Glen International in Watkins Glen, New York), and one of six national series road course races (Xfinity Series racing at Watkins Glen, Mid-Ohio Sports Car Course and Road America; and the Camping World Truck Series at Canadian Tire Motorsport Park). It is also host to the Verizon IndyCar Series and several other auto races and motorcycle races such as the American Federation of Motorcyclists series. Sonoma Raceway continues to host amateur, or club racing events which may or may not be open to the general public. The largest such car club is the Sports Car Club of America. With the closure of Riverside International Raceway in Riverside, California after the 1988 season, NASCAR, wanting a west coast road course event to replace it, chose the Sears Point facility. Riverside Raceway was razed for a shopping center development. In 2002, Sears Point Raceway was renamed after a corporate sponsor, Infineon. However, as with many renamings of sports complexes, many people still call it by its original name (it was never affiliated with Sears, Roebuck and Company, having been named for the nearby Sears Point Ranch founded in the 1850s by settler Franklin Sears). On March 7, 2012, it was announced that Infineon would not renew their contract for naming rights when the deal expired in May, and the track management is looking for a new company to take over naming rights. Until it can find a new corporate sponsor, the course is simply identifying itself as "Sonoma". Kevin Harvick entered Sonoma with a 15-point lead over Martin Truex, Jr. Joey Logano entered 56 back. Dale Earnhardt, Jr. entered 68 back. Jimmie Johnson entered 70 back. Following a miscommunication in the Xfinity race at Chicagoland Speedway that resulted in 19 cars pitting before pit road was officially opened, NASCAR announced that the indicator light at the entrance of pit road would be controlled by the officials in race control instead of an official at pit entrance. The entry list for the Toyota/Save Mart 350 was released on Friday, June 19 at 2:32 p.m. Eastern time. Forty-four cars were entered for the race. All but the No. 95 Leavine Family Racing Ford driven by Michael McDowell were entered for the previous race at Michigan. Three driver changes took place for this weekend. Boris Said drove the No. 32 Go FAS Racing Ford in place of Mike Bliss. Alex Kennedy drove the No. 33 Hillman-Circle Sport LLC Chevrolet for Ty Dillon. Justin Marks attempted to make his first start of the season in the No. 34 Front Row Motorsports Ford for Brett Moffitt. The No. 98 Phil Parsons Racing entry, driven by Josh Wise, switched from Ford to Chevrolet for this race. 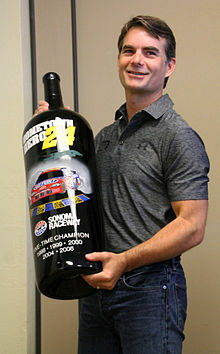 Jeff Gordon, the all-time winningest driver at Sonoma Raceway, made his 23rd and final start at the track. Clint Bowyer was the fastest in the first practice session with a time of 74.979 and a speed of 95.547 mph (153.768 km/h). Kyle Busch was the fastest in the final practice session with a time of 74.489 and a speed of 96.175 mph (154.779 km/h). A. J. Allmendinger won the pole with a time of 74.385 and a speed of 96.310 mph (154.996 km/h). "I’ve really got to thank all my guys that are here and especially back at the shop," Allmendinger said. "They’ve worked on this car so much to do everything that we need to get as much speed out of it as possible. So, it’s a good day, but we’ve got to focus on tomorrow.” “It has a nice balance all the way through, the braking and transmission gears, and the overall corner speed," Kurt Busch said after qualifying second. "It’s a nice package that (crew chief) Tony Gibson gave me, and all the guys back at the shop." “Yeah, we kind of overachieved today," Matt Kenseth said after qualifying third. "We were really bad yesterday, we were really bad the first round. I’m pleasantly surprised and kind of confused as far as we’ve been off, but we’ll take that.” "I think the car was capable of being at least first or second," Jeff Gordon said after qualifying fifth. "I missed one corner there on that last run and I don’t know how much that cost me, but overall it was a really solid effort." Brendan Gaughan was the lone driver that failed to make the race. Kurt Busch dominated the early stages of the race. The race was scheduled to start at 3:19 p.m. but started three minutes later when A. J. Allmendinger led the field to the green flag. Kurt Busch jumped ahead of Allmendinger in turn 2 and led the first lap. The field settled into a single file rhythm. Jamie McMurray made an unscheduled pit stop on lap 10 for a flat right side tire. Denny Hamlin also made an unscheduled pit stop on that lap for a loose right-rear tire. The first caution of the race flew on lap 22 when David Gilliland slid off the track and slammed into the tire barrier in turn 10 due to a flat left-front tire. “That was a bad deal," Gilliland said. "I just passed Sam Hornish Jr. up in seven and went through the esses and I just told Donnie (crew chief Wingo), ‘I think I’ve got a left-front going down. It’s soft.’ We were gonna come in and pit that lap and I eased up a little bit going through 10, but it never turned and once you get off in the dirt there that’s a bad place to get off. "It was a big hit, but I’m OK. I’m just bummed out for the situation. This is a great race track. We really love racing out here and I’ve had some great finishes here, but we’ll have to wait until next year to try again.” Under caution, Clint Bowyer opted not to pit and assumed the lead. The race restarted on lap 27. Kyle Busch passed Bowyer in turn 7a to take the lead one lap later. The second caution flew on lap 29 when David Ragan made contact with Martin Truex, Jr. and turned him into the wall in turn 8. “When you’re mid-pack, it’s not a good place to be,” Truex, Jr. told Fox. “It’s just really congested. We were a lot faster than a couple of guys around us and you’re trying not to get run over and you’re trying to make moves. Every time I passed the 55, he would just keep staying on the side of me and not giving me three or four inches to get clear so we could all get going. I guess he turned me on purpose. I ran into the side of him first, so I kind of had it coming. But that was an accident. I thought I gave him enough room there coming out of the esses.” Ragan gave his take on the incident after exiting the race on lap 79. “I didn’t get together with the '78', the '78' ran me off the race track, just body slammed me," said Ragan, who finished 39th. "I was just trying to get back on the race track. That’s a great instance where the '78' just absolutely did me wrong and I’m trying to get back on the race track. That’s unfortunate for him, it’s never good to see anybody tear up their race car. Martin would probably not do that again if he had an opportunity.” The damage to the concrete wall was severe enough that NASCAR red flagged the race on lap 32 for 10 minutes and 30 seconds. The race restarted on lap 34. Kurt Busch passed brother Kyle Busch in turn 11 to take back the lead on lap 40. Matt Kenseth blew out a left-rear tire in turn 4a and had to make an unscheduled pit stop on lap 45. A number of drivers, including Jeff Gordon, began hitting pit road on lap 52. Kurt Busch gave up the lead on lap 53 to make his pit stop and gave it to Jimmie Johnson. Jimmie Johnson led the most laps in the race. Justin Allgaier ran out of fuel halfway through the race. Allmendinger began reporting fuel pickup issues on lap 57. He made an unscheduled pit stop on lap 60. Justin Allgaier ran out of fuel on lap 65, but coasted the car back to pit road and the race stayed green. Johnson hit pit road on lap 67 and the lead was given back to Kurt Busch. The third caution of the race flew on lap 74 when J. J. Yeley, exiting turn 10, got loose and hit the inside wall. Johnson opted not to pit and reassumed the lead. The race restarted with 32 laps to go. The fourth caution of the race flew on the same lap when Carl Edwards, entering the esses, hit Ragan and spun down into the wall. The race restarted with 26 laps to go. Kurt Busch went off track in turn 10 with 14 laps to go. The air intake became covered with grass. Debris on the front stretch brought out the fifth caution of the race with twelve laps to go. Exiting turn 11, the left-rear wheel house of Casey Mears's car came off. While Johnson opted to stay out, almost every other driver opted to pit for tires. Coming into his pit box, Matt DiBenedetto got clipped and turned by one of the track's cleanup trucks. The race restarted with seven laps to go. Kyle Busch passed Johnson climbing up turn 3 to take the lead with five laps to go. Michael McDowell went off track in turn 7a with three to go, but got the car going and the race remained green. Kyle Busch drove away to score his 30th career win. And it is also the first time that the Busch brothers had a 2-1 with Kyle in first and his brother, Kurt, in second. Kyle Busch celebrating winning the 2015 Toyota/Save Mart 350. Fox Sports covered their seventh race at Sonoma Raceway and their first since 2006. Mike Joy, Larry McReynolds and Darrell Waltrip had the call in the booth for the race. Jamie Little, Chris Neville, Vince Welch and Matt Yocum handled the pit road duties for the television side. PRN had the radio call for the race, which was simulcast on Sirius XM NASCAR Radio. Doug Rice and Mark Garrow called the race in the booth when the field was racing past the pit straight. Pat Patterson called the race from atop turn 3a when the field was racing up turns 2, 3 and 3a. Brad Gillie called the race from a platform outside turn 7a when the field was racing through turns 4a, 7a and 8. Rob Albright called the race from a billboard outside turn 10 when the field was racing down turns 8a, 9 and 10. Heather DuBoise, Brett McMillan, Jim Noble and Steve Richards worked pit road for PRN. Kevin Harvick left Sonoma with 53 point lead over Martin Truex, Jr.
^ Paul Menard started from the rear of the field for an engine change. ^ Michael Annett also started from the rear of the field for an engine change. Wikimedia Commons has media related to 2015 Toyota/Save Mart 350. ^ "2015 NASCAR Schedule" (PDF). NASCAR.com. NASCAR Media Group, LLC. August 26, 2014. Retrieved June 23, 2015. ^ "Sonoma Raceway". NASCAR.com. NASCAR Media Group, LLC. January 3, 2013. Retrieved June 23, 2015. ^ "Entry List". MRN.com. Motor Racing Network. June 22, 2015. Retrieved June 23, 2015. ^ "First Practice Results". MRN.com. Motor Racing Network. June 26, 2015. Retrieved June 26, 2015. ^ "Final Practice Results". MRN.com. Motor Racing Network. June 26, 2015. Retrieved June 26, 2015. ^ "Qualifying Results". MRN.com. Motor Racing Network. June 27, 2015. Retrieved June 27, 2015. ^ "Toyota/Save Mart 350 Results". MRN.com. Motor Racing Network. June 28, 2015. Retrieved June 29, 2015. ^ "Points standings" (PDF). Jayski.com. NASCAR Statistics. June 28, 2015. Retrieved June 30, 2015. ^ "Manufacturer standings" (PDF). Jayski.com. NASCAR Integrated Marketing Communications. June 29, 2015. Retrieved June 30, 2015. ^ Paulsen (June 29, 2015). "Overnights Down, But Not By Much, For FS1's NASCAR Finale". SportsMediaWatch.com. Sports Media Watch. Retrieved July 3, 2015. ^ a b Paulsen (June 30, 2015). "NASCAR From Sonoma Least-Watched in Years". SportsMediaWatch.com. Sports Media Watch. Retrieved July 3, 2015. ^ "Raceway Track Facts". Sonoma Raceway website. Speedway Motorsports. Archived from the original on January 17, 2013. Retrieved January 15, 2013. ^ "Sonoma Raceway to lose Infineon name". San Francisco Chronicle. Hearst Communications Inc. March 8, 2012. p. B-2. Retrieved March 8, 2012. ^ Bruce, Kenny (June 28, 2015). "NASCAR tower to operate pit-road entrance light". NASCAR.com. NASCAR Media Group, LLC. Retrieved June 28, 2015. ^ Bonkowski, Jerry (June 26, 2015). "Bowyer fastest, Danica 4th-fastest in first Sprint Cup practice at Sonoma". nascartalk.nbcsports.com. NBC Sports. Retrieved June 26, 2015. ^ Bonkowski, Jerry (June 26, 2015). "Eight of last 10 Sonoma winners fastest in Friday's final practice". nascartalk.nbcsports.com. NBC Sports. Retrieved June 26, 2015. ^ a b c d e f Wackerlin, Jeff (June 27, 2015). "Allmendinger Scores Sonoma Pole". MRN.com. Sonoma, California: Motor Racing Network. Retrieved June 27, 2015. ^ Spencer, Lee (June 28, 2015). "Two big hits early at Sonoma - video". Motorsport.com. Motorsport.com, Inc. Retrieved June 28, 2015. ^ a b c d e "2015 Toyota/Save Mart 350". Sprint Cup Series. Season 67. Sonoma, California. June 28, 2015. Event occurs at 3:22 p.m. Fox Sports. Fox Sports 1. Retrieved July 21, 2015. ^ a b McFadin, Daniel (June 28, 2015). "Martin Truex Jr. wrecks on Lap 28 at Sonoma". nascartalk.nbcsports.com. NBC Sports. Retrieved June 28, 2015. ^ a b Wackerlin, Jeff (June 28, 2015). "Truex: 'He Turned Me on Purpose'". MRN.com. Sonoma, California: Motor Racing Network. Retrieved June 29, 2015. ^ McFadin, Daniel (June 28, 2015). "Jimmie Johnson leads midway through the Toyota / Save Mart 350 at Sonoma". nascartalk.nbcsports.com. NBC Sports. Retrieved June 28, 2015. ^ a b McFadin, Daniel (June 28, 2015). "Pole-sitter AJ Allmendinger's bid for Sonoma win ends with mechanical issue". nascartalk.nbcsports.com. NBC Sports. Retrieved June 28, 2015. ^ a b Wackerlin, Jeff (June 28, 2015). "Kyle Busch Shines at Sonoma". MRN.com. Sonoma, California: Motor Racing Network. Retrieved June 29, 2015. ^ Pennell, Jay (June 28, 2015). "Kevin Harvick overcomes struggles to earn top-five Sonoma finish". FoxSports.com. Fox Sports Interactive Media, LLC. Retrieved June 30, 2015. ^ Turner, Jared (June 28, 2015). "Jimmie Johnson's chance at Sonoma win dashed by final caution". FoxSports.com. Fox Sports Interactive Media, LLC. Retrieved June 30, 2015. ^ Spencer, Lee (June 29, 2015). "One last time: Jeff Gordon finishes 16th at Sonoma". Motorsport.com. Motorsport.com, Inc. Retrieved June 30, 2015. ^ Brad Gillie [@BradGillie] (June 28, 2015). "My view from Turn 7 for the @PRNlive broadcast at @RaceSonoma. @SiriusXMNASCAR" (Tweet). Retrieved June 28, 2015 – via Twitter.